Make a spider web cake or spider cupcakes. Bake a regular cake (bonus points if you make it orange colored) and pour black ganache or thin frosting on top. Then add white frosting very sparingly and pull it to make a spiderweb design. You could also make edible, adorable spiders. Take a marshmallow and dip it in chocolate. Then use chocolate covered pretzel sticks for the legs. Add a face if you’d like to make it extra cute or extra creepy! If you want to make a scarier cake for adults, bake a red velvet cake. Frost the outside and then add drippings of red frosting to look like blood. Put a knife in the center to make it even scarier. Make different types of desserts that are mummy themed. For example, bake a pie and put the puff pastry topping on in layers to look like a mummy. Add eyeballs to make sure it looks mummy-like. You could also add these puff pastry layers on top of a cheese dip or layer puff pastry over hot dogs to make a mummified dog. Make some spooky witch fingers. Start by making chocolate covered pretzels and color white chocolate to look a little green. Then add a slivered almond as a fingernail. If you are going to an adult party and are planning to make drinks or Jell-O shots, try putting them in syringe shots. Serve drinks in beakers and make the theme a monster laboratory. If you want to go a healthier route, make fruit look like classic Halloween items. An orange can easily become a pumpkin or jack-o-lantern. A sliced banana can become a ghost with chocolate accents. An apple can be sliced to look like teeth. Rice Krispy treats can help you create any shape you desire. Make your treat look like a brain, a pumpkin, giant candy corn and much more. You can also use Halloween shaped molds to shape the Rice Krispy treats into anything you desire for a more polished look. Lastly, just be creative! What is your favorite Halloween character or spooky item? Make that into a fun appetizer or dessert. You can also dye food items green to look like toxic waste or orange and black for the classic Halloween colors. 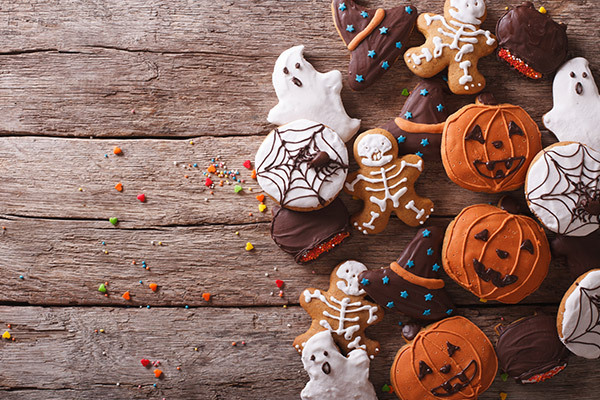 Which fun Halloween food will you try for your children, grandchildren or your Halloween party? What are your plans for this Halloween? If you enjoyed these ideas, please share with your friends before Halloween!